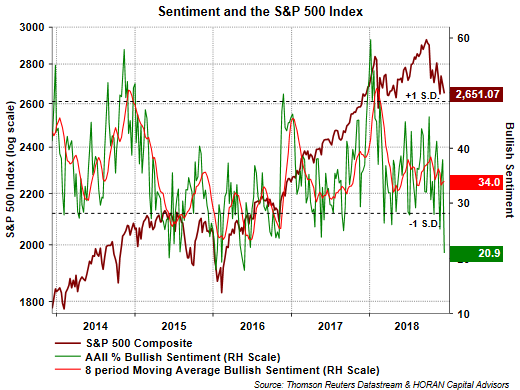 The American Association of Individual Investors reported sentiment data for the week ending December 12, 2018. The sentiment survey reported the largest change in the difference between bullish and bearish sentiment since April 11, 2013. The swing in the current week equaled -35.4 percentage points. In terms of bullish sentiment, the level of 20.9% is the lowest bullish sentiment level since May 26, 2016 when bullish sentiment was reported at 17.8%. 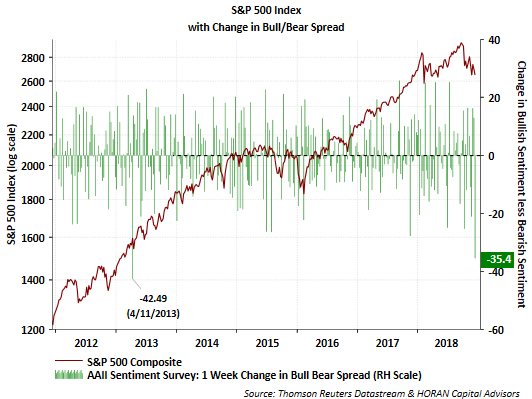 As noted in the past, these sentiment measures are contrarian ones and are more actionable at their extremes and this week's reading certainly puts the low bullishness level at an extreme.